When it comes to dessert, Passover can make things tricky without flour. But there’s plenty of chocolate and coconut macaroons to be had and flourless chocolate cake. 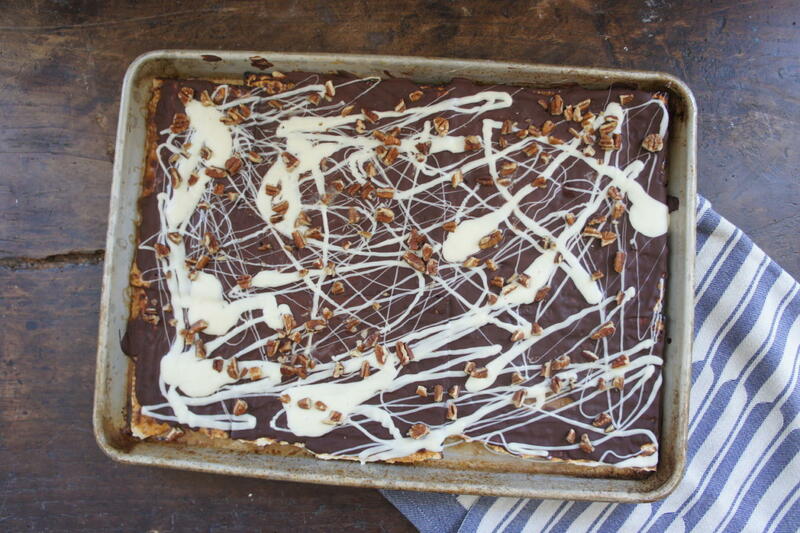 And one of our favorite Passover dessert hacks is matzah toffee, which some like to call matzah crack. 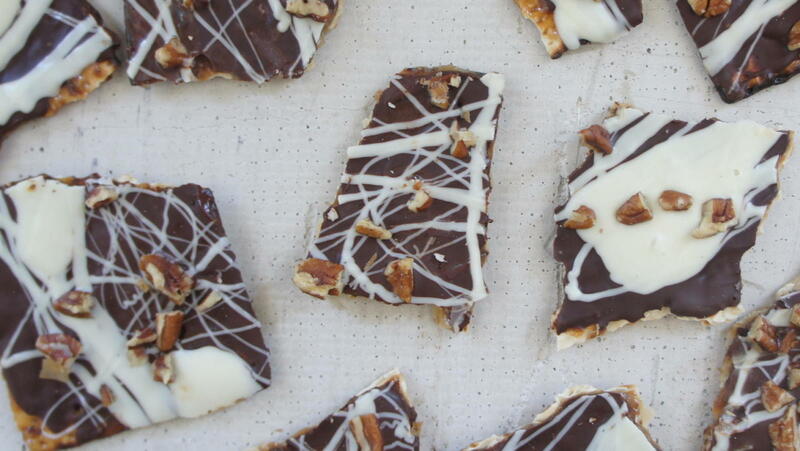 We don’t know about you, but somehow this toffee-and-chocolate-covered matzah situation fulfills all our dessert cravings: crunchy, salty, chocolate, and EASY to make. Like really easy. We topped ours with melted white chocolate and pecans, but you can get creative and try dried fruit, candied ginger, coconut flakes or even crunched-up potato chips. Watch our easy recipe below, and then get in the kitchen to whip up a batch. Or two. Arrange matzah in one layer on the baking sheet. Break matzah into smaller pieces in order to fill the pan completely. Set aside. Pour the butter and sugar mixture over the matzah, gently spreading it with a spatula to cover it with an even layer. Put matzah in the oven and turn the heat down to 350 degrees. Bake for 15 minutes, checking every so often to make sure it doesn’t burn. Turn heat down to 325 if it looks like it’s burning. After 15 minutes, the butter and sugar mixture will have bubbled up and turned golden brown. Remove from the oven. 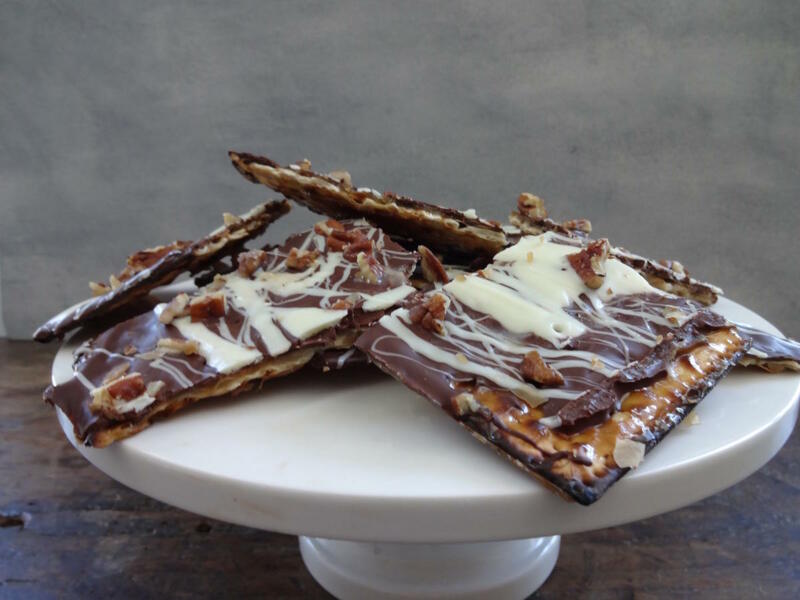 Sprinkle matzah immediately with the semisweet chocolate chips. Let sit for 5 minutes to melt. With a fork, drizzle the white chocolate over the matzah. Then top with chopped nuts, and let cool. When the chocolate has hardened, break into smaller pieces and serve! 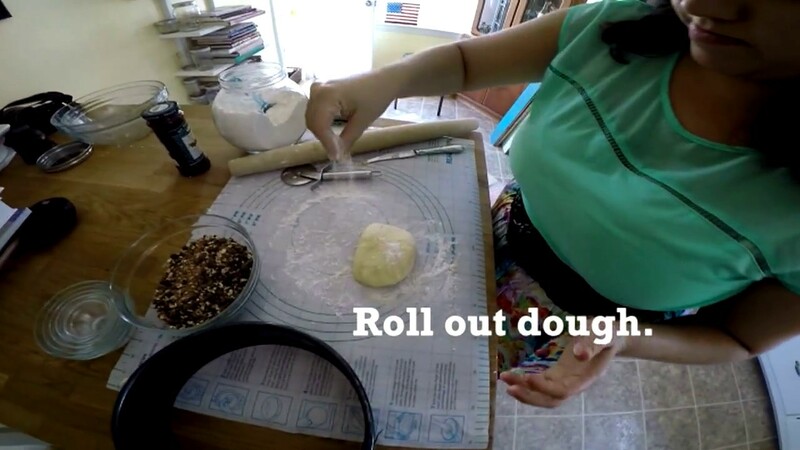 Make creamy, flaky dough and cut it like a pro using, of all things a pizza cutter.